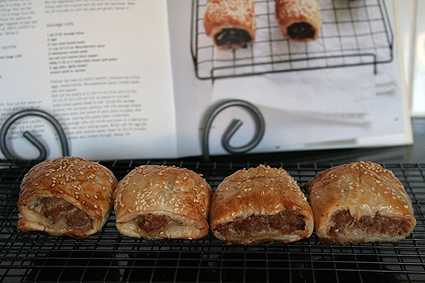 One of my first “speciality” dishes when I was a teenager was sausage rolls. I’ve been craving them lately so I tried a Donna Hay recipe and used pork mince. They weren’t anything special at all. I wouldn’t make that recipe again. Attempt two I went back to my original recipe, clipped from a weekly magazine when I was in high school. Much better! These are not health food people, just so you know. I used sausage mince which is cheap as chips and is a mixture of pork and beef mince. Why the two containers of tomato sauce (ketchup)? Hubby likes Heinz, I like Fountain. Growing up, my mum liked Heinz and my dad liked Fountain. Guess we’ve just always been a two-sauce family.